May Member Spotlight: Elizabeth Wagner - The Junior League of Boston, Inc.
Today we spotlight JL Boston BOD member Elizabeth Wagner who recently took an EPIC trip across 3 countries as part of AJLI’s partnership with Cross Cultural Solutions (CCS). Read on to hear about her amazing experience! My mom was a member in the League where I grew up. She was President when I was 9 years old, and I remember her dressed up in a blue chiffon dress going to the their gala. My mom and I participated in other charity organizations as I grew up so I knew joining the Junior League was something I wanted to do at some point. I always thought I would live in Boston for a short time so didn’t join right away, but I fell in love the city and have stayed. After completing graduate school at MIT, I finally felt like I had the time to commit to my community and to the Junior League. That is when I joined. You recently went on an EPIC trip, visiting multiple different countries- could you tell us about your experience and what you learned about the world from visiting so many different cultures? 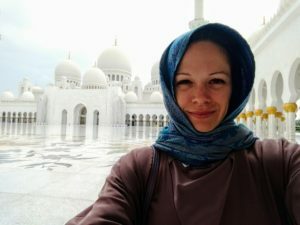 I was fortunate to have the opportunity to travel for 2.5 weeks in March to 3 different countries: India, the Maldives and the United Arab Emirates. Each country and each experience was very different. Contrast the millions of people living in New Delhi, India, in poverty with endless amounts of burning trash on the streets and horrible air pollution but with a vibrant culture to an isolated hut over gorgeous crystal clear waters in the middle of the ocean to the newly built metropolis of Dubai with breathtaking architecture and luxury emanating from all corners. In Delhi, I participated in a service project through AJLI’s partnership with Cross Cultural Solutions (CCS). Fifteen other Junior League women and 3 of their husbands also participated. We stayed in apartment buildings in the Hauz Khas village where we had a cook prepare us 3 meals a day. 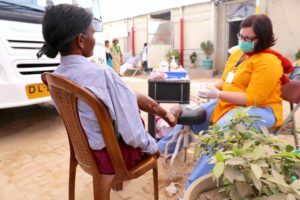 For those who haven’t been to India, the water is not safe to consume (or even to brush your teeth with) so special precautions and food preparations were essential to all of us staying healthy. The food was absolutely delicious! We had a different curry for each meal served with roti, salad, basmati rice, and dhal (traditional lentil soup). 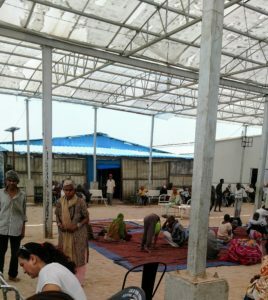 Our service projects varied but I was assigned to work at Earth Saviours (www.earthsaviours.in), assisting the mentally disabled elderly who were brought there because they were abandoned by their families and were living on the streets. We spent time talking to them, although most didn’t speak English and we didn’t speak much Hindi, so the communication was difficult. We painted the nails of the ladies and passed out hand lotion. They drew pictures for us with the paper and crayons we provided them. One JL member who is a registered nurse helped the medical staff with wound care. It is hard to describe because it was unlike anything I had ever experienced. All my senses were fully engaged: the smells of 100 people living in the same room and the burning trash in the distance, the sounds of people talking to themselves not making any sense and the construction in the background banging all day long; the sights of a man with polio walking on all 4 limbs and mice running around their living quarters. Two elderly men died while we were visiting; there was a brawl between 2 men that had to be broken up; and there was a woman who had murdered her entire family and didn’t even know she had done it. On the other hand, there was a younger woman who had lost an arm to infection, but she always had a smile on her face and gave us a big hug when we arrived. There was an old man who was a former captain in the Indian army who had great joy in telling stories from the battlefields, and there was a young man with savant-like math skills who used to be tempered and aggressive but is now fully functioning and looking to assimilate back into society. Although it didn’t feel like we were having an impact, we were; just by being there and showing them that someone cared for them was enough. An important part of CCS programming is the cultural immersion. Each day we did a different activity that taught us something new about the Indian culture. We learned about the history, we visited different religious temples, we experienced classic dance, and we shopped at local markets. The Indian culture is rich in history, rich in colors, rich in tastes and rich in pride. My next stop was the Maldives. I knew I wanted a relaxing few days after India, and since I was so close, it was an easy decision. The Maldives is an archipelago in the Indian Ocean consisting of 26 atolls (and over 1,000 coral islands). 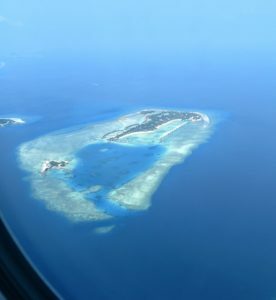 Not all islands are inhabited, but the ones that are, are either inhabited by natives or are leased/owned by a resort for tourists. One reason I wanted to go to the Maldives is that it is being threatened by the rising ocean waters so I wanted to go sooner than later. The Maldives is the lowest country in the world, with an average natural ground level of 1.5m above sea level. It is possible that the islands will be underwater in our lifetime. Because of this issue, the country and resorts are taking measures for sustainability. The country has pledged to be carbon-neutral by 2019, and basically all new development is being done by building up. That is, sand/dirt is being shipped in to elevate the ground levels and buildings are being built on higher foundations. Despite the environmental concerns, it is an absolutely breathtaking country. Flying in and out you see many of the islands from an aerial view, which is picturesque. The snorkeling and scuba diving is fantastic because of the coral reefs. I saw a sea turtle, sting rays, sharks and dozens of different species of fish. The natives make a living similar to most island nations: fishing and tourism. The majority of natives are now Sunni Islam, after having a history of several different religions, including Buddhism. The sand beaches and clear waters make it a perfect paradise. My final stop was to Dubai in the UAE. I spent 3 nights, which I found wasn’t quite enough time to experience all of what the UAE has to offer. Dubai is a huge city with different sections: the old town, the financial district, the marina, and a few others. The wealth in the country is undeniable, and catering to the wealthy and wealthy tourists is one way the country plans to thrive after their oil reserves dry up (estimated to occur by 2060). The old town was rich in history of what Dubai was like before the 5 Emirate states came together to form the UAE. The financial district and marina are newer developments with some fascinating architecture and luxurious shopping areas. 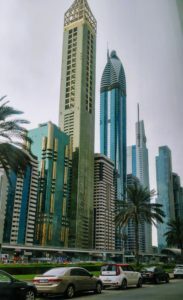 Surprisingly, 80% of residents in Dubai are expats; half of those from Pakistan and the Philippines and the remainder from various countries like Australia, the UK and the US. All business must be conducted under Muslim laws, so for example, alcohol can only be served in restaurants. I found it refreshing that in a Muslim country the expats respect the local culture, and at the same time the locals respect that the expats have different views and also encourage them to come and live there. To me, it appeared to be an example of how diverse cultures, people and views can come together and live in relative harmony. I spent one day visiting the sites in Dubai and one day visiting the sites in Abu Dhabi. The Sheikh Zayed Grand Mosque in Abu Dhabi is worth seeing sometime in your life. It is unbelievably beautiful and humbling and peaceful. I wish I had more time to experience the UAE because it exceeded my expectations. Do you have a favorite or most memorable part? 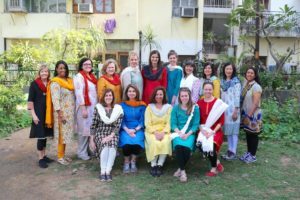 One of the best aspects of the trip was meeting the other wonderful Junior League ladies who attended the India Cross Cultural Solutions portion. Learning their stories, their reasons for participating in the service trip and their motivations for being in the Junior League was inspiring. It brings me comfort to know that there are so many amazing women doing good in the world. Plus, I made some fantastic new friends in other parts of the US that I can visit! Does your experience traveling the world relate at all back to your view of volunteering/giving back? Just do it! I joined the Junior League to make new friends and to get involve in my community. I didn’t realize that it would offer so much more. The trainings and opportunities to lead in a low risk environment have been so valuable to my personal development. Don’t get me wrong, some of my best friends in Boston are fellow Junior League members and the volunteer experiences are amazing, but I can’t think of another organization that offers so many opportunities to better oneself personally and professionally. So, give it a try! We will do our best to make the experience as transformative as possible. Favorite Summer activity in Boston? There are so many! I love running around the river and sailing in the harbor, but I have recently taken up golf so I am looking forward to lots of time on the links this summer. Plus, nothing beats the 4th of July celebration on the Esplanade with friends, food and good wine!